I'm back in the hospital, feeling a bit like a pin cushion at the moment, hooked up to three different bags of antibiotics (metronidazole, vancomycin and gentamicin). I also just took my first doze of tamiflu and zofran, since my stomach is not quite sure how it feels about the antibiotics at the moment. As you may have guessed, it's been quite the day. It started at 3 am when I woke up, coughing until I managed to grab my inhaler and shaking uncontrollably, despite the half dozen blankets I had piled on top of me. After an hour of shaking I decided to get up and take a bath. Then back into bed, still shivering. Half an hour later my temperature read 102.76. I asked Paul to call the hospital, sat up, got very, very sick and began to struggle to get ready. Every movement made me gasp for breath and lean back to rest, dizzy. Paul was ready to call an ambulance when I struggled to put my arm into my shirt. I finally made it downstairs into the car and then Paul went back and woke the girls and loaded them into their car seats. By now it was 6 am. I made it into the hospital with a temperature of 100, that suddenly spiked to 103.1 degrees. Everything ached. Baby and I both had elevated heart rates, and my lovely blood pressure frequently showed numbers like 83 over 40. Despite drinking gatorade all night, they quickly determined that I was quite dehydrated and it took three tries to find a vein that could support an IV. Then came blood tests that needed to be from two separate locations. With a grand total of six band-aids on my arms I was starting to feel a bit like a pin cushion. My doctor arrived and the next concern was that when they pressed on my stomach and let go, pain would shoot through my back on the lower right hand side. That meant my next trip was to a cat scan machine, where it was found that one kidney was enlarged (which could be a pregnancy thing), but my appendix was found to be fine. Which meant we'd be moving on to the test that I really wasn't looking forward to: an amniocentesis. The fear was (is) that there's an infection in the amniotic fluid that's making both me and the baby sick. At this point this test isn't really risky, since the worst case scenario was my water breaking, and I'm far enough along that that isn't a real concern (although we'd certainly like to go longer if we can). I felt like fainting when they told me that they don't numb you for an amnio. The room was full of doctors and nurses as they attempted to find an available place in my uterus that wasn't full of wiggling baby. On of the nurses realized that I was on the verge of having a breakdown and came over to hold my and. I watched the needle go in on the ultrasound, breathed a sigh of relief that the worst was over and then... The Boy moved and the needle was pulled out. They'd have to try a second time. The second try was on the other side, and was successful. 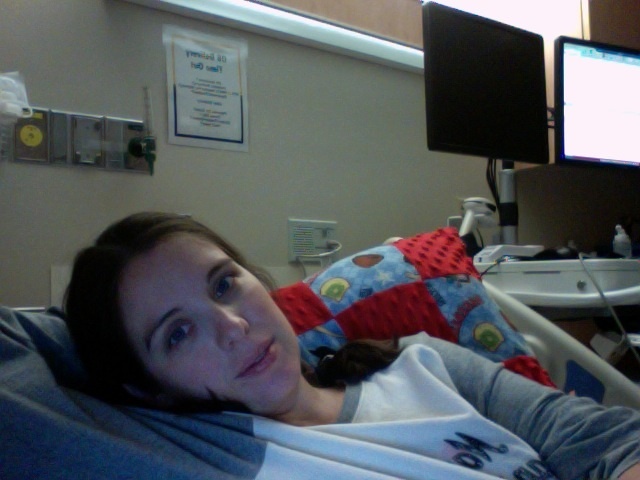 And then I was moved along to labor and delivery where I was admitted. By then the doctors knew that some sort of protein levels had jumped from 0 last night to 21 this morning, apparently indicating an infection (along with slightly elevated white and red blood cell levels). Another doctor arrived and talked to me about the possibility of a c-section if the infection continued, if they couldn't find the source, and I agreed, because I know that in my current shape I can hardly walk and breath, much less attempt a VBAC and so if they need to get him out quickly I'll agree to whatever it takes. A short while later the first of the infectious disease doctors arrived and examined me and asked all sorts of questions, from whether or not we'd eaten out recently, to where we purchase cheese, where we buy it and what kind of cheese we eat. They said that they doubt a bacterial infection, they believe it's a nasty virus, but that they'd be running further tests on the many samples that were taken, including the amniotic fluid, and that the tests would likely be complete on Friday or Saturday and that I'd be staying until then. The infectious disease doctor explained that even though the likelihood was small of a bacterial infection, the risk if it was bacterial was quite simply too high to ignore, since they're the type of diseases that are deadly, especially since I'm pregnant. After that I was wheeled downstairs, since one of the doctor's thought my lungs sounded like they might have a problem, and it was time for chest x-rays. And then, finally, I was taken off the no liquids diet and given ice chips and a popsicle. After being unable to eat anything since an apple yesterday morning I was pretty excited. I've worked my up to a cup of sprite too now and ice water, which has made thing much less miserable (no water for 12 hours is tough, even when you've had four bags of fluids). The nurses brought in a comfortable bed from another part of the hospital and Paul brought over my computer and a few supplies. Now I'm going to try to get some sleep and hope that somebody figures something out soon (or that one of the many medications work!). Thanks to everyone who's praying for us! We really appreciate it! I have a feeling that this is going to be a long week. I am sorry to hear about that you're experiencing! I will certainly pray for you and your son - and your doctors! Oh my goodness, prayers going out right now for you, your family, your health, your poor husband who must be outside of his mind with worry...anc that you get some healing rest and the peace of God. Oh my goodness! We are praying for you and sweet baby boy! Hang in there! Cam, you and your little one are in my prayers. Try to rest. God bless. I hope you recover quickly!! Why are they giving you so many antibiotics if they think it's viral? I hope they figure out what is going on and I'll be praying that you and your little boy will be safe. thanks for sharing an update. you have been on my heart. my family continues to raise you up in prayer. may Christ's peace fill you! Prayers here too. I've been down with a virus pregnant and it is not fun at all. My sympathies as you wait. Cam, we are praying for you and your family! How scary! Praying for you all! Thinking about you today and praying for you, sweet gal!!! Lots of love your way. Oh my, Cam, offering my day for you and your little guy! wow. you are dealing with a lot! i'll be praying for a quick recovery and a smooth delivery. Oh dear! And I thought your next post would be announcing the arrival of The Boy! Many fervent prayers are being said for your and your baby's health and your peace of mind. God bless. Prayers for you, Paul and the girls. Many, many prayers for you and baby boy (Patrick) to get well fast. May God keep you safe and your doctors and nurses filled with the wisdom needed. Many prayers for Paul as he shoulders this load along with law school until help arrives. And prayers for Sadie and Mae Bae as it is hard when mommy is sick. Prayers for you and baby boy to get well fast. Prayers for your doctors and nurses to solve the problem and provide care. Wisdom for them. Prayers for Paul as he shoulders this load along with law school. Prayers for Sadie and Mae Bae because it is hard when momma is sick and away. Prayers for you and your precious baby! May God hold you in the palm of His hand! Patiently waiting for a happy update. . .no, I lie. . .I'm impatiently waiting.